Tyler Byrnes was raised in the rural town of South Wales, situated in Western New York State near Buffalo where he lived until age of eighteen. His dual experience of tight-knit small town and Rust Belt life influenced his interest in intimate character stories of the insular, disillusioned, and those unable to express themselves due to societal pressures. 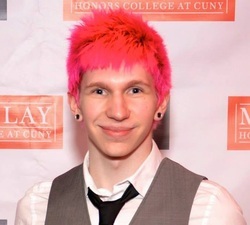 Determined to take advantage of the excitement and opportunities of film in New York City, he was accepted into the Macaulay Honors College at the City University of New York Hunter College with a full scholarship. Byrnes quickly entered into the film production program at Hunter, finding great excitement in both the analytical and technical facets, including writing, directing, and cinematography. Soon he began working on independent projects, such as Asian-American web series 2 Girls 1 Asian as co-producer, co-writer, director of photography, and editor. He joined Boxed Wine Productions as an affiliated artist, contributing both technical and creative expertise to original short films, promotional videos, and event videography. In the summer of 2013 Byrnes was invited to participate in a film and theatre residency in Superior, Nebraska hosted by playwright A.P. Andrews, where he produced, wrote, and shot two short films. Most recently Byrnes has screened two of his short films, Missed and Sling, as part of a demonstration of promising Hunter College Film & Media Department students to media students from Utrecht University in the Netherlands. Missed went on to screen as a finalist in the CUNY University Film Festival in April 2014, and Sling screened as official selection at AGLIFF in September 2014. "Byrnes landed as a finalist in the film festival with five-minute film called Missed about a woman painting over wallpaper fitting for a newborns room telling the story of a couple who experienced the toll of a miscarriage. “Sometimes things get in the way, sometimes you can’t complete them,” surmised Byrnes. Given his submission, it was clear that months of effort had been dedicated towards the delicate details such as lighting, directing, and content." "While Byrnes said he considers the scenarios in [Adolescents] similar to ones he’s experienced, he gave the actors authorship over their characters, which allowed them to craft their own interpretations. Miles G. Jackson, who plays the son, Alex, in the film, said it was interesting to shoot something autobiographical. “There is a sort of fragility there; while the specific circumstances are Tyler’s, I have those too,” Jackson said. Byrnes said he used the same actors to portray their characters at two very different ages, to create visual representations of their emotional ages after they endure a tragedy. “Alex must grow up to deal with the complexity of the situation, while Deborah (the mother) is pulled back into an uncertain age, her support structures crumbled before her,” he said.